How to delete Duplicate of the images ergo Pictures, (rename, select) ? 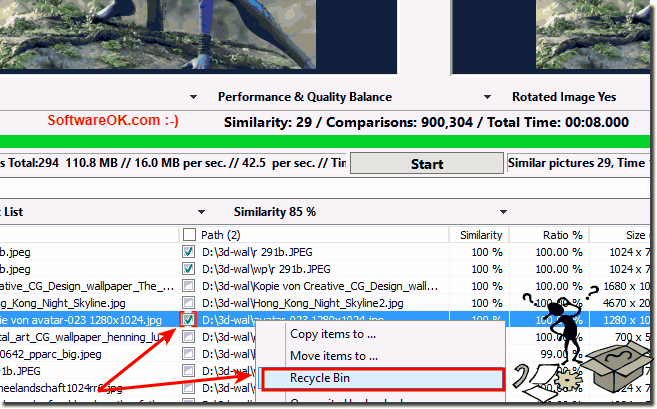 It is very easy to find and delete under Windows Duplicate of images ergo Photos, with the freeware FSI.OK! 1.) ... Delete the double pictures in the result list! Please always use ... the latest version of Find.Same.Images.OK! 1.) Delete the double pictures in the result list! Just start the search for duplicate or similar images. After you have received the results, just check the box next to the unwanted image files and then delete all! In FSI.OK, you can select the images through the Check boxes and then select the Trash option (in the context menu via right click on results list view). 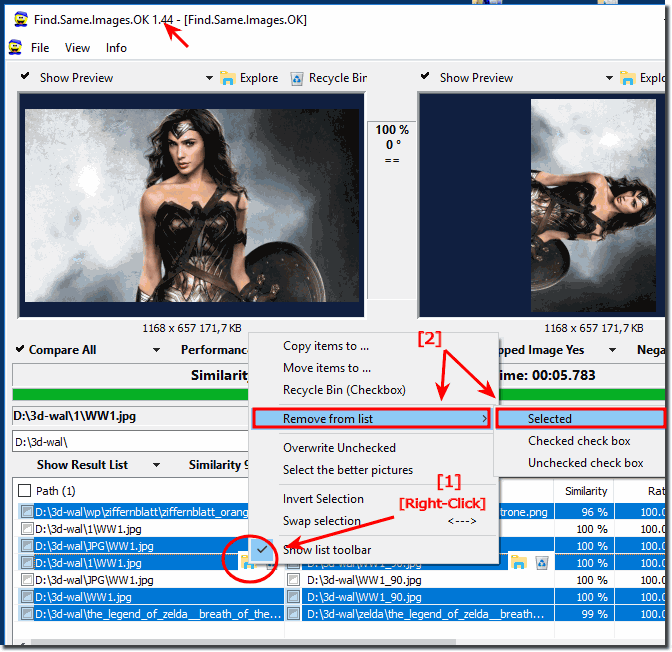 (Image-1) Find and delete Duplicate of the Images or Pictures! Once you have the program installed on the computer, it will automatically find copies of photos or photos with varying degrees of similarity. You only need to select the folder to search and start the search. With an innovative technology for comparing photos based on content, FSI.OK analyzes each photo in the selected folder and finds exact copies or similar matches according to the content of the image on the pixel basis. 2.) Mark and rename in FSI.OK! 2b.) ... Renaming the pictures! Here the pictures are only removed from the list and not deleted. When marking yourself Just follow the general marking rules. Read this : ... Do mark consecutive files! (Image-2) Mark an Remove Duplicate of the images in the Result List! Use the arrow keys up and down to get to the desired image file and thus faster to rename the same, especially those who are in the list view! (Image-3) How to delete Duplicate of the images ergo Pictures? As you can see above in Windows 10 shot screenshot, it is simply duplicate the images, ergo photos, mark, rename, or delete. You can apply this solution easily and without hesitation on earlier versions of Microsoft's Windows operating systems. The rules for the duplication of images, photos to mark, rename or delete are always the same no matter if it's a native Windows desktop, on the go in coffee on a tablet PC, Surface Pro / Go, or even in the office on an MS Server operating system is. It has been tested and successfully verified. various MS OS. Find.Same.Images.OK - FAQ-6: How to delete Duplicate of the images ergo Pictures, (rename, select) ?